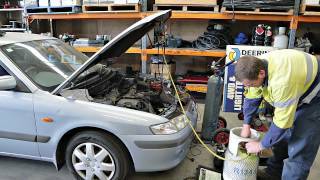 Deering Autronics has been Perth’s leading auto electrician for over 60 years. You can find us at two conveniently located workshops south of the river – Jandakot and Midland. We started in 1952, honing our skills as tradesmen and becoming specialists in our field. Over the years, our dedication to quality has made our name synonymous with premium professional air conditioning and auto electrical services. We take great pride in providing comprehensive services for a range of vehicles including cars, 4x4s, trucks, trailers, caravans and boats. Contact us today. Paying meticulous attention to detail does not just apply to our work; our team of auto electricians has been handpicked for their product knowledge, precision and passion for excellence. They have a wealth of experience in auto electric repairs, diagnosing and servicing. This includes working with a variety of auto electrical parts across different industries. Deering Autronics stocks an extensive range of batteries, alternators and starter motors, including accessories for all your transportation needs. From rear vision camera systems to dual battery setups, replacement trailer plugs and 4×4 adventure products, you’re sure to find what you’re looking for at any of our workshops. We also stock quality parts and accessories for Perth’s mining and farming sectors. An alternator play an important role in your vehicle. They charge your battery and help power your vehicle’s electrical system while you drive. If your alternator is faulty, some of your vehicle’s electrical systems may fail. Make sure to contact a professional auto electrician when this happens. We offer auto air conditioning services and repairs for all types of vehicles, including passenger, commercial, mining, farming and even aeroplanes. A regular service will ensure faults are addressed in a timely manner and will save you money, time, and hassle down the line. Batteries are essential for the daily running of your vehicle and crucial to its proper functioning. Continued technological development has resulted in more electronic systems on the market, and faulty batteries and connections can wreak havoc on your car’s electronics. We stock an extensive range of car batteries for virtually all vehicle makes and models. Enquire today for your car battery service or replacement. Do you drive a 4×4? We have an impressive range of 4×4 accessories for you to explore. Call our friendly team today and find out how you can enhance the drive, and look and feel of your 4×4. At Deering Autronics, we enjoy taking on the challenge of problem solving. Our team is available to help you make the most of your vehicle and the many journeys that await. Contact us for auto electric services and make sure your vehicle is running at peak performance. We carry an extensive range of auto electrical parts and accessories to suite your car, truck, 4wd, trailer, boat, caravan, motorcycle, tractor, etc as well as parts and accessories within the Mining and Farming sectors. Deering Autronics are the proud WA distributor of all BARTCO products and operate a service and repair center for the entire BARTCO product range. Deering Autronics are the proud distributor of Gali Air Starter products in Australasia and South-East Asia, and have done so for the past 10 years. Visit one of our service centers today.